Sister Veronica Maria Stawski, S.S.J. Sister Veronica Maria Stawski, S.S.J. 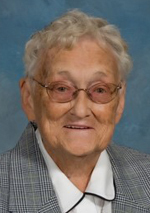 (formerly Sister Ann Louis), died Dec. 29 at St. Joseph Villa, Flourtown. She was 94. Daughter of the late Louis and Julia Stawski, she was born in Newark, N.J. and attended Blessed Sacrament Grade School and Newark Arts High School. She entered the Sisters of St. Joseph in September 1943 and professed her final vows in August 1951. She ministered in the dioceses of Camden and Metuchen, and the archdioceses of Newark and Philadelphia. Sister Veronica was preceded in death by sisters Marie Kelley, Beatrice Mackey, Regina (Sister Mary Veronica of Jesus, O.P.) and Ann Stukenborg. She is survived by nieces, nephews, grand-nieces and grand-nephews, as well as members of her congregation, the Sisters of St. Joseph. The funeral Mass was celebrated Jan. 4 at St. Joseph Villa. Donations in Sister Veronica’s memory may be made to St. Joseph Villa, 110 W. Wissahickon Ave., Flourtown, PA 19031.